Workspace 365 brings together everything you need. This allows you to work from your browser on any device, at home, in the office or wherever you are. With Workspace 365 you can reach your local, web and Windows applications with just one click from one digital workspace. People who use the workspace don’t have to install anything themselves. They instantly get access to the applications, documents, information and news that’s relevant to them. Within just a few clicks you can add a new app or news source for a group or individual. Our goal is to hide technology for people. The people who use the workspace don’t have to log in to a hosted desktop, they just simply open applications with one click. Show information from applications directly in Workspace 365. All your unread e-mails, appointments, recently edited documents and more at a glance. Single Sign-On makes it possible to reach both web- and Windows* applications with just one click, without having to log in seperately for each application. Subsequently, you can give temporary employees a workspace and afterwards you can deny them all access by deactivating the workspace. 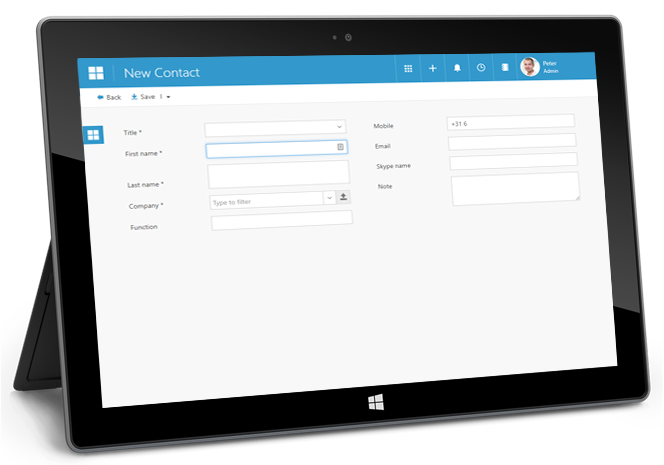 For Single Sign-On to web apps we use Windows Azure or our own Single Sign-On technique. This way we use the security from Microsoft and all data is stored safely. *Windows applications will be available with Single Sing-On when using Workspace 365 Hybrid, combined with Citrix XenApp or our Clientless RDP. Bring all documents together in one online workspace. This way you work on- and offline from any device. 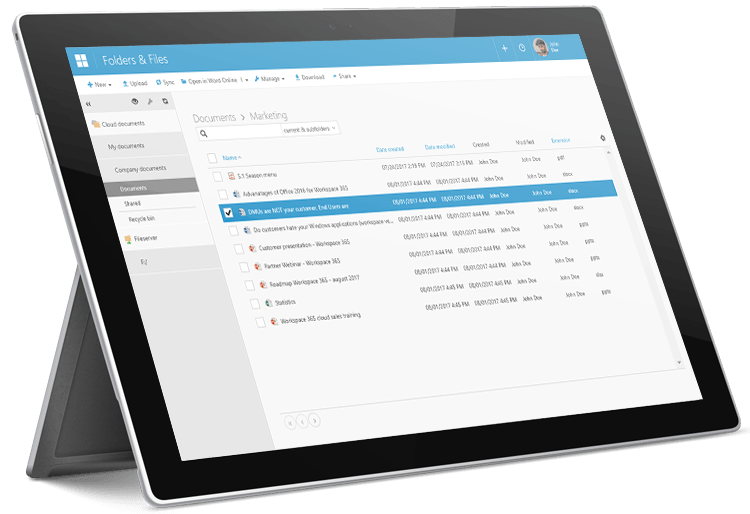 the document app combines and brings structure to Office 365, the fileserver, OneDrive and SharePoint. Many companies want to transition to Office 365, but still have to deal with legacy (Windows) applications & fileservers. 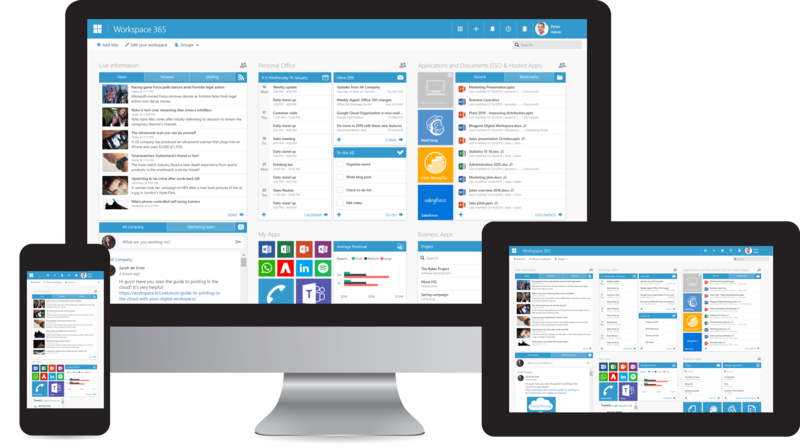 Bring them together into one online workspace, so you can simply access to local, web and Windows applications, the file server and cloud document solutions. 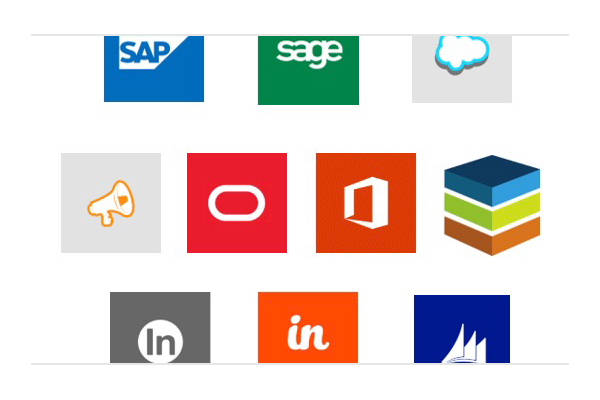 With Workspace 365 Business Apps you simplify and automate business processes. All data is organised, so you can quickly find (company) information. For instance, you can quickly log projects or activities. It’s also possible to export an offer or invoice in a template with just one click.